SUNDAY, Feb. 11, 2018 (HealthDay News) — Has your favorite tabby gotten a tad tubby? You can help that fat cat slim down safely. But be forewarned: It won’t happen overnight. Researchers at the University of Illinois put eight overweight neutered male cats on a diet for 18 weeks. They wanted the cats to lose enough weight to be noticeable but not enough to put their health at risk. “The intent with this diet was a healthy weight loss: getting rid of fat while maintaining lean mass. The big question was how much does it take to make cats lose weight, especially lazy neutered males?” said Kelly Swanson, a professor in the department of animal sciences. “It turns out you have to keep reducing their food intake because they’re not very active. It takes a long time,” he said in a university news release. The goal was to help the cats shed 1.5 percent of their body weight per week. That’s in line with recommendations from the American Animal Hospital Association. Faster weight loss risks liver trouble. “They can’t handle that much,” Swanson said. 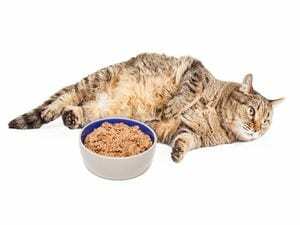 The researchers started by reducing the cats’ food intake by 20 percent, and then kept cutting it back every week — just like people might do to see continued results on the scale. “When we go on a diet ourselves, we might lose a lot of weight in the first few weeks and then hit a road block. Same with these animals,” Swanson said. “We had to keep going down, but it can be hard to convince a pet owner to do that. You might get owners to reduce intake from 60 to 50 grams per day, but we’re telling them they might have to go to 45 or 40 grams. We got really low, but we were monitoring them so they were healthy,” he explained. As the cats lost weight, the researchers noticed that some types of bacteria in their guts became more abundant, while others decreased. These changes may be beneficial but more research is needed, the study authors said. Swanson’s team also watched to see if the cats became more active as they slimmed down. Even so, he said owners should encourage their cats to get as much exercise as possible by playing with them and placing food bowls farther from their favorite resting spots. The study was published in the February issue of the American Journal of Veterinary Research. The Humane Society of the United States has more on fat cats.